Ten patterns, hundreds of possibilities. Flexible patterns for your favourite yarns, in gorgeous colours and textures. 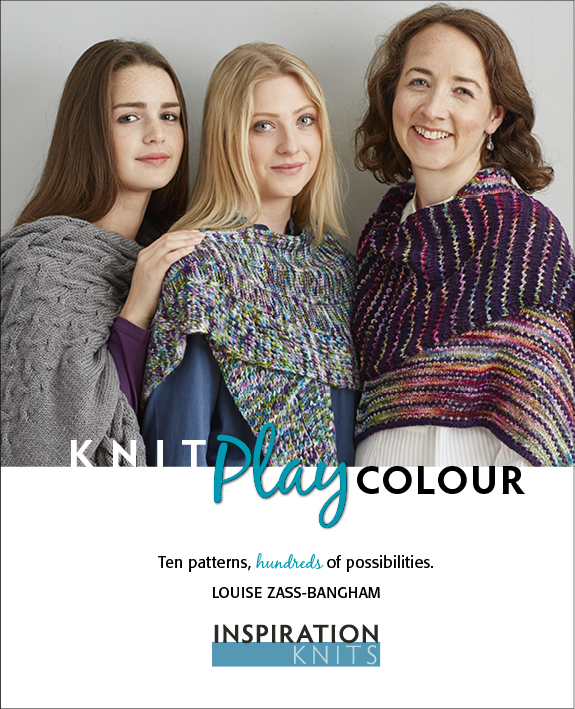 KNIT PLAY COLOUR is a collection of ten patterns, for shawls, cowls, scarves and a blanket. These are modern classics for intermediate knitters. Some are on the easy side, others feature cables, slipped stitches or lace. You can knit each beautiful design exactly as written…or you can play. At the end of every pattern you will find ideas on how to “play” with the design. Playing starts with little changes that will make the project yours – perhaps just changing the colours. The options progress to adjusting the project’s size or yarn weight. Stick to what feels comfortable, or go on an adventure. You can take each project in different directions. Make the 4ply cowl in DK. Turn the blanket into a shawl. Find a way to show off that special skein. Incorporate your scraps into a gorgeous scarf. You’ll find lots of samples and swatches to inspire and help you. Practical tips are given for each design. I hope you will learn something with each project, but the main aim is to enjoy your knitting. The flexibility of the patterns means that whether you’re in a yarn shop, at a show or shopping your stash, you’ll find a yarn you’d love to use. I hope this will become your go-to book for impulse buys and stash-busting. Let’s have fun with yarn and colour! I was pretty sure that this was a must have book but after seeing the interview on the Muststash Podcast I was totally convinced. What a great book and knitting resource!